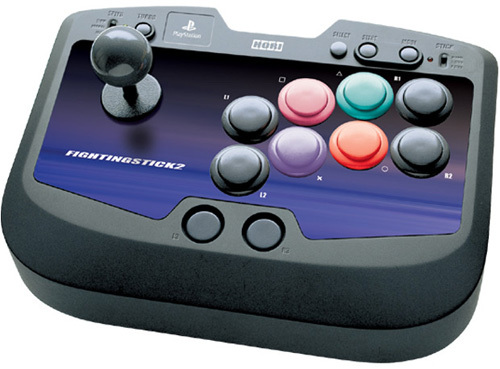 High quality arcade stick which is compatible with Playstation One and Playstation 2 as standard. The joystick can act as the D-pad, left-stick or right-stick by flicking a switch on the case. Supplied with the HORI Fighting Stick are two adapters, connecting cables and a USB stick with associated software. Using this it is possible to connect additionally to PS3, Xbox 360 and PCs. By adding a Windows PC (not supplied) it is possible to play on PS4 and Xbox One. When used on a PC, or in PC link-up mode, it's possible to set the controller as a PC mouse controller for basic use, and also for in-game play add latching, auto-fire, binding of multiple controls to a single button/movement and profile shifting/changing. Digital joystick can act as D-pad, Left or Right sticks. Eight Analogue buttons (pressure sensitive). TURBO feature for "rapid fire". Compatible with PC, PS3, Xbox 360 and with a Windows PC link-up, Xbox One and PS4.